Welcome to NewsDirect411: French President Macron Attacks Nationalism As He Address US Congress. Mr Macron said such policies were a threat to global prosperity. He said the US had invented multilateralism and now needed to reinvent it to create a new 21st Century world order. Mr Macron also hailed the "unbreakable bonds" of the US and France, forged in "liberty, tolerance and equal rights". The French president was given a three-minute standing ovation as he took his place in the chamber for his speech. Mr Macron has developed a strong relationship with President Donald Trump, becoming the first foreign leader to be afforded a US state visit. But the French president's comments showed that the pair do not agree on all subjects. 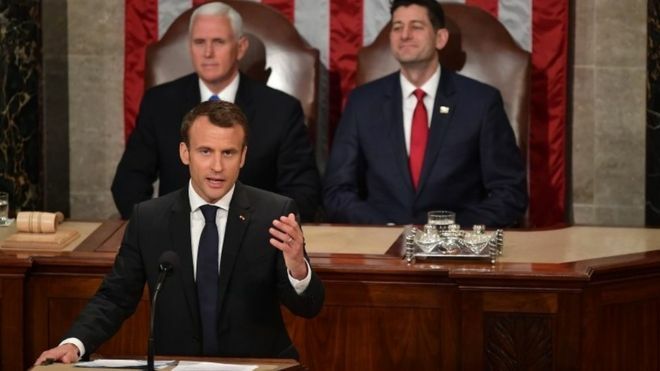 Mr Macron said isolationism, withdrawal and nationalism "could be tempting" as a "temporary answer" but they "would not douse, only inflame, the fears of our citizens".